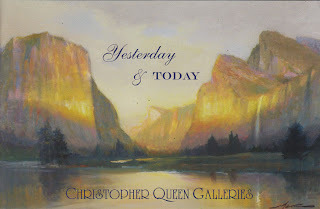 Beginning October 7th, the new Christopher Queen Gallery will be having a show with a very interesting concept. 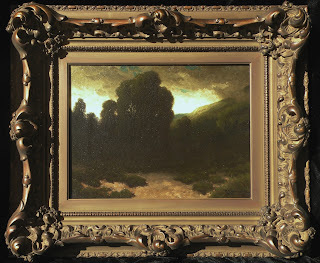 If you've ever visited their website, you would have seem that they show many Early California painters. 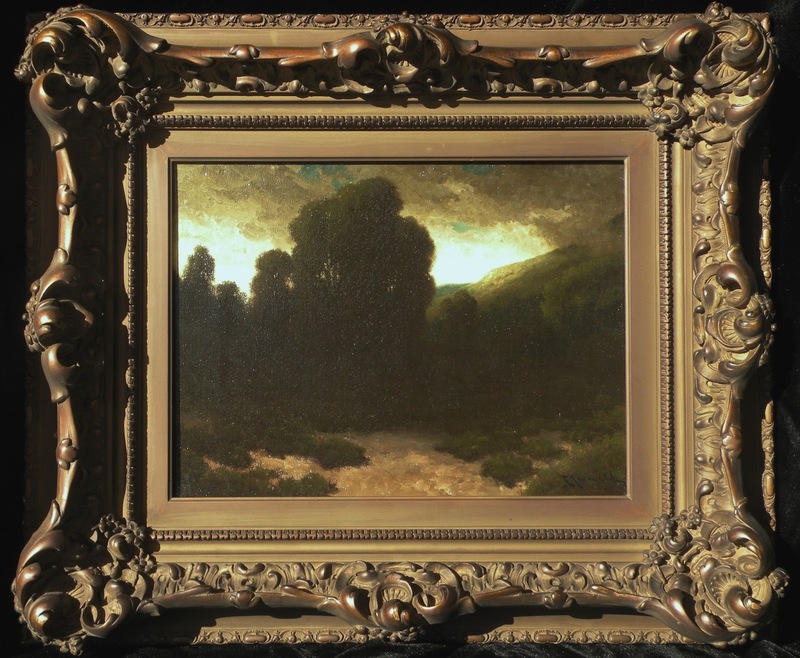 For this show the gallery asked us participating artists to create a piece of art based on an inspiring piece of Early California artwork. The new artwork and the one which inspired it will be showing side-by-side. The reception is October 7th and the show will be up for a few months. It's really interesting to see how literal some people interpreted the paintings and how far others loosely interpreted their chosen piece. 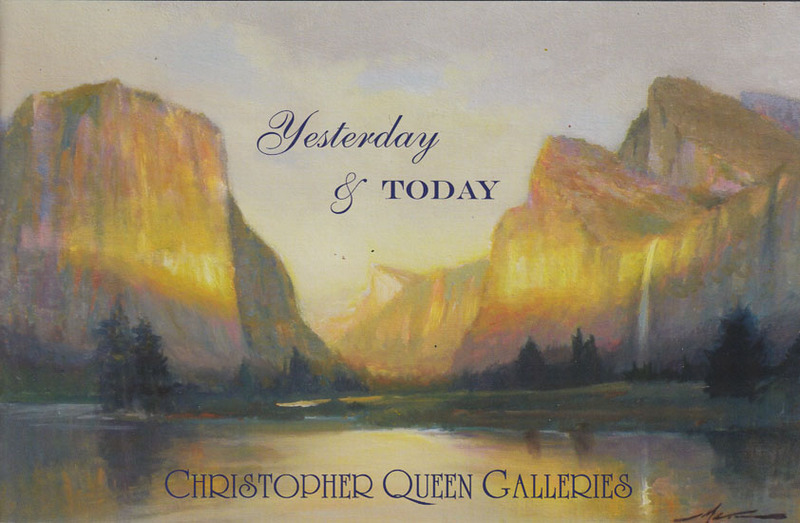 Front cover of the brochure: F. Michael Wood. When I was in Monterey(more accurately, Marina Dunes), I hiked around the area to gather reference for the painting I chose to do. As I was exploring the area, I found myself in a "bowl" created by the valley of the dunes. When you look east you can see the Salinas Valley and the Hollister Hills. Looking west you will see the vast Pacific Ocean. I think I took a risk with the format and composition of these, especially with the "Looking East" one. I'll leave it to you to decide whether or not it was successful, but I'm proud of myself for not taking the safe route. 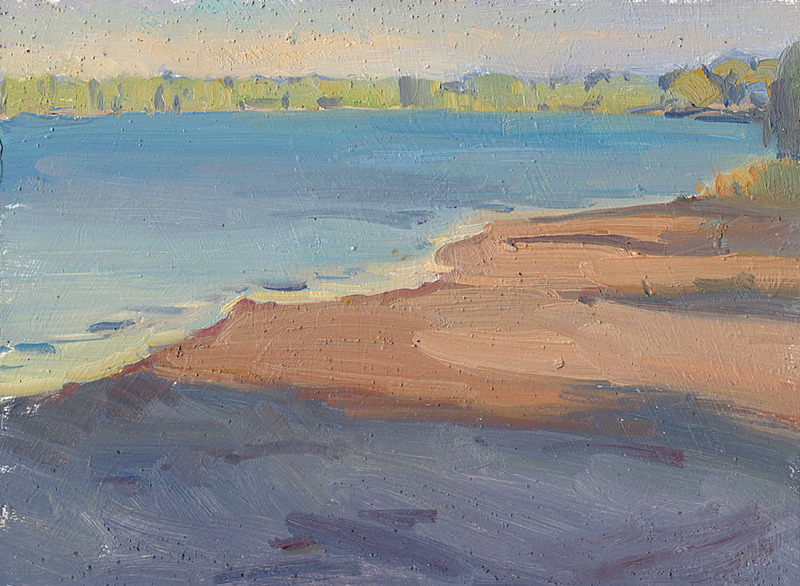 "Hiking The Dunes, Looking West," 12x40 in. oil on linen mounted on board. "Hiking The Dunes, Looking East," 12x40 in. oil on linen mounted on board. 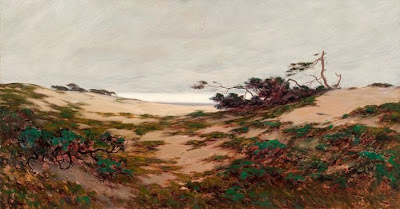 The painting which inspired these 2 paintings: "Windswept Dunes" by Charles Chapel Judson. This painting is meant to be the "little sister" to the larger painting by Robert Van Vorst Sewell. Even though the gallery doesn't have a ton of figurative works, I wanted to take on a painting that I could showcase my skills in this regard. It let me play with the of my favorite subjects: females, patterns and profiles. The Sewell is about 3 feet high, and this painting is a mere 12 inches. 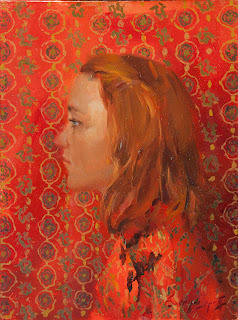 "Chinese Vermillion" 12x9 in. 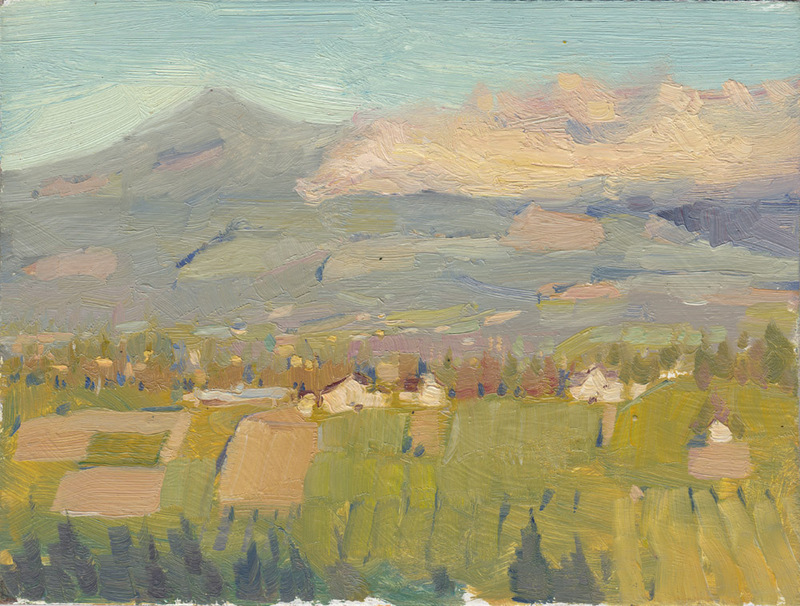 oil on linen board. 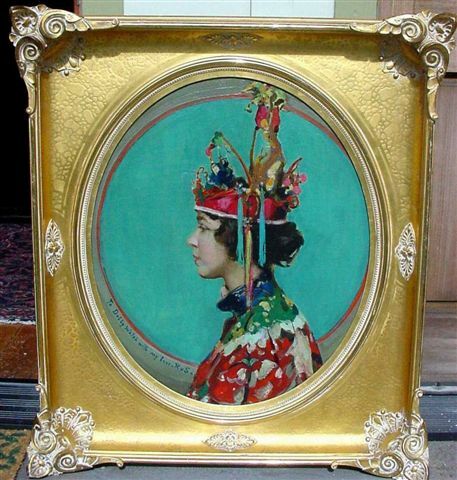 "Chinoiserie" by Robert Van Vorst Sewell. This painting was inspired by the way the mysterious darkness of the Jonnevold painting and the beautifully designed curves of the trees. Out of all the paintings, I learned the most by doing this one. 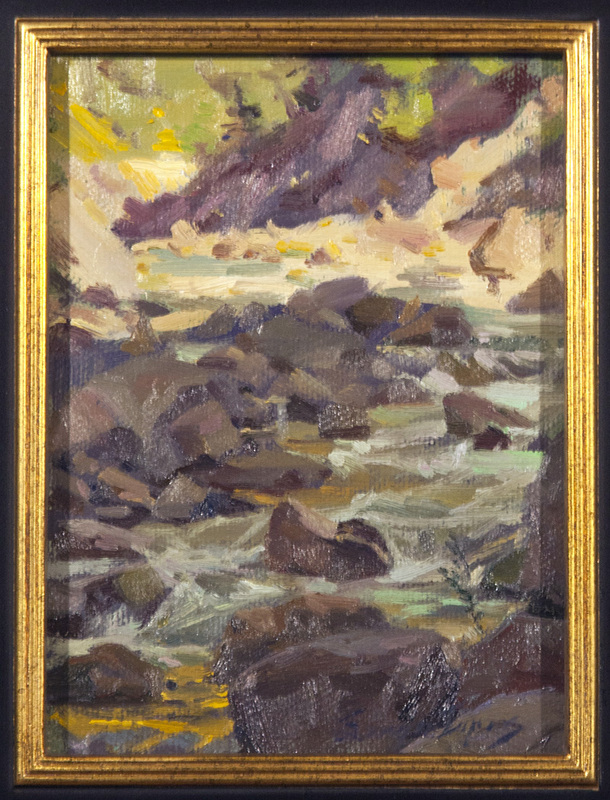 In the early stages of this painting (the plein air part of it) I had broken up the silhouette too much and put too many skyholes in the mass of trees. This broke up the design needlessly. Darkening the skyholes and simplifying the silhouette improved this painting immensely, and I probably would have not thought to do this without referring to the Jonnevold. 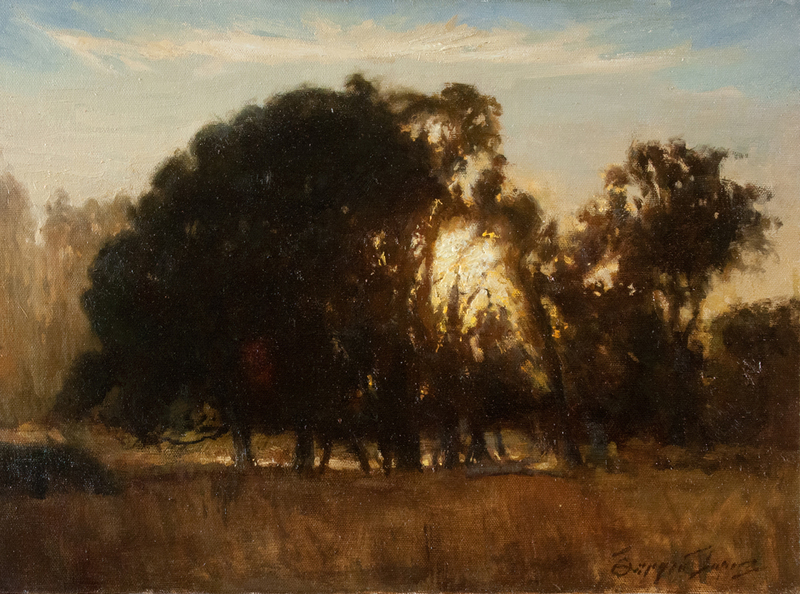 "Farmside Silhouettes" 12x16 in. oil on canvas board. "Twilight Silhouettes" by Carl Henrik Jonnevold. I'm really looking forward to this show and I hope some of you get to experience it for yourselves! 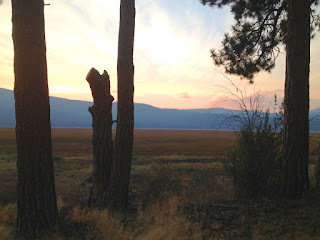 A place I love to stop and take in is the Humboldt Lagoons area. It is right on the coast, but it is separated from the ocean by thin strips of land. I did a quick study which I will develop into a finished painting soon. 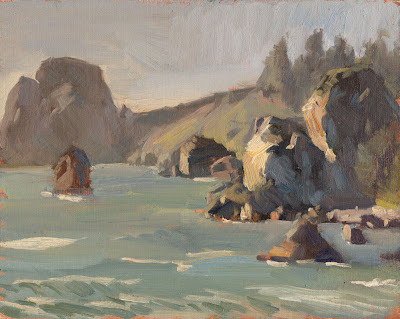 Along my road trip north I stopped at False Klamath Cove to paint this amazing scene. I don't know why they call it "False Klamath Cove" but it's a beautiful little piece of the Northern California coast. I painted this one with only a medium-sized bristle filbert. I had a lot of fun painting this one. I used a lot of grays to exaggerate the atmospheric perspective. This is a pretty muted color scheme going on here. I love driving through the forests of Northern California, especially Jedediah Smith Redwoods State Park. I really want to come back and spend a few days in the area. I arrived in Portland the next day. Man this city is pretty when the sun is out! I actually have never been here during a rainy day, so I pretty much only have sunny memories of the city. I checked out the Portland Art Museum because I knew they had sent up from the Irvine Museum a good amount of paintings from their collection. 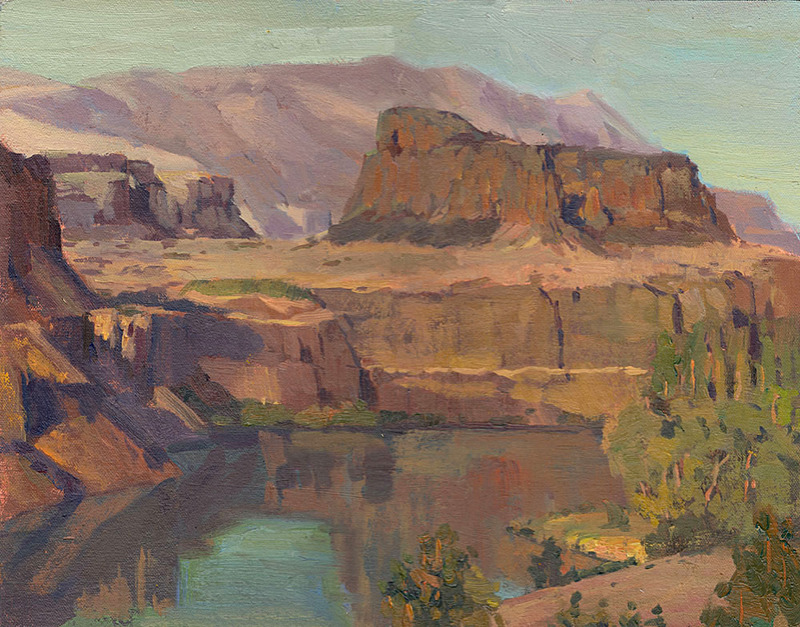 It's always good before a plein air event to check out some of the best plein air painters who have ever lived for some inspiration. The last leg of the road to Hood River is the Columbia Gorge. It's got to be one of the most scenic little stretches of highway around. Once I arrived I settled in to my lodging which was a cozy little vacation rental home in the middle of town. One of the nice things about it was that a lot of us participating artists stayed in the place. It's always fun when we can get together at the end of the day and talk shop/share our work. The first day of the event I painted a cottonwood at the end of this farm known as the Columbia Gorge White House. This is always the orientation spot for the Pacific Northwest Plein Air event. It does bear resemblance to the Valley Of The Moon area southeast of Santa Rosa, so it was a good place to warm up with something familiar. 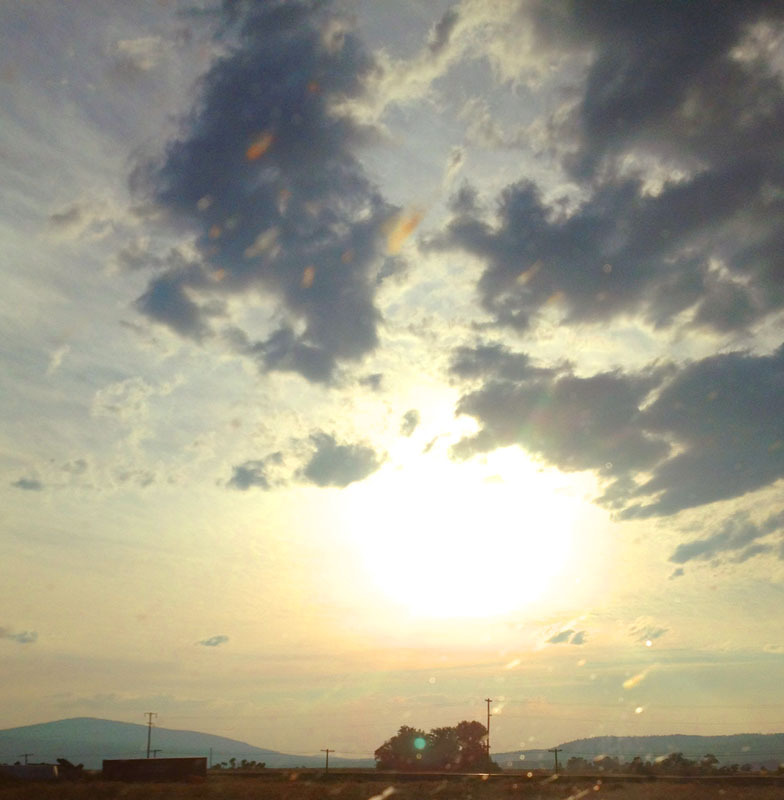 I feel like a lot of Oregon shares a big resemblance to Northern California. Oregon lacks the redwood trees and eucalyptus, though. This year I had a few places I wanted to paint at, but I was mostly going to be playing it by ear. I was mostly interested in painting with my friends rather than really compete this year, so I was open to all suggestions. There was a place called the Nordic Center which in the winter is used as a ski resort. When the snow thaws out, it is home to lovely waterfalls and beautiful meadows. My piddly iPhone picture doesn't do much justice to the beauty of the area. I tried to do better with the painting I made of it, but I am not sure I nailed it there either. The color is decent on this painting. We went afterwards to Mayer State Park, west of Hood River on the 84. I've never had good luck painting here. Last year it was deathly heat, and this year the wind was intimidating us out of painting the best views here. 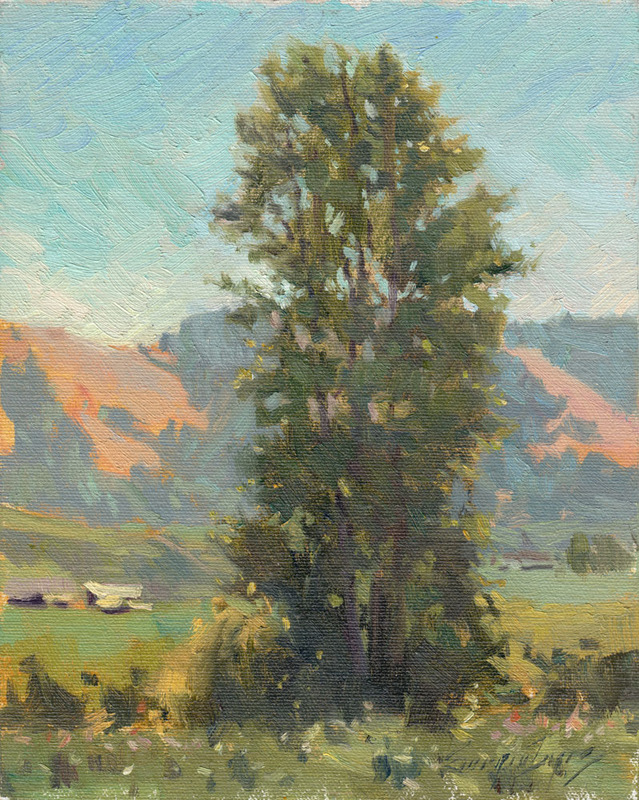 Rather than throw in the towel and head back to town (waste of time) I just set up and did a quick study of the trees catching the rapidly changing evening light. I did this painting in about a half-hour. Some of the strokes are nice, and I think it got me on the right track for painting sunset colors so I am really glad I did it. The next day we decided to paint at sunrise. Meaning, we woke up at 5:30 am to paint these! This is the earliest I've ever woke up to paint. 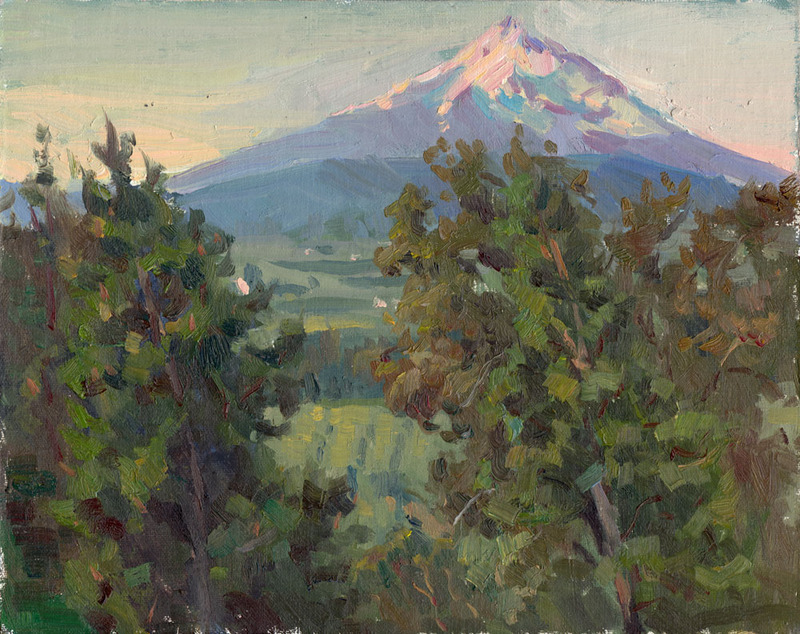 The color of the rising sun on Mount Hood was staggeringly beautiful. I feel like I failed miserably to capture the effect compared to my fellow painters: Portland artists Michael Orwick and Za Vue. There were about 8 artists up there at Panorama Point at the crack of dawn. Pretty impressive considering the time we had to wake up. There was this weird low-hanging cloud that stayed where I was painting there the entire time. 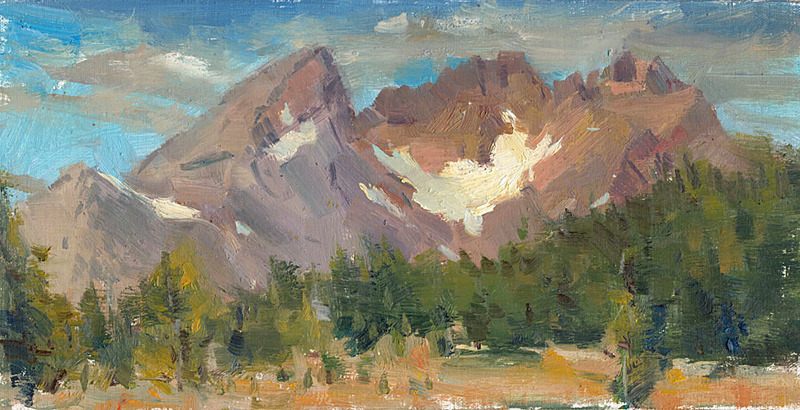 I did a quick painting of the view next to where I had started on the Mt. Hood painting. The morning sun lit up the hills with a beautiful golden light. I kept the painting at a pretty high key. As a color study I believe it works quite well. 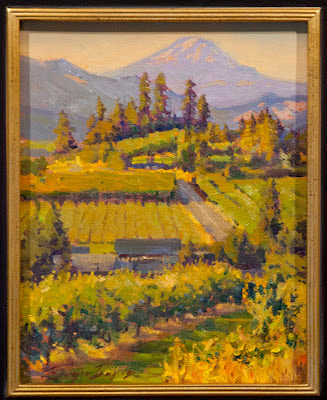 After getting some breakfast and a bit of rest, we drove up to Washington to meet up with local artist Eric Jacobsen. Man he is good. 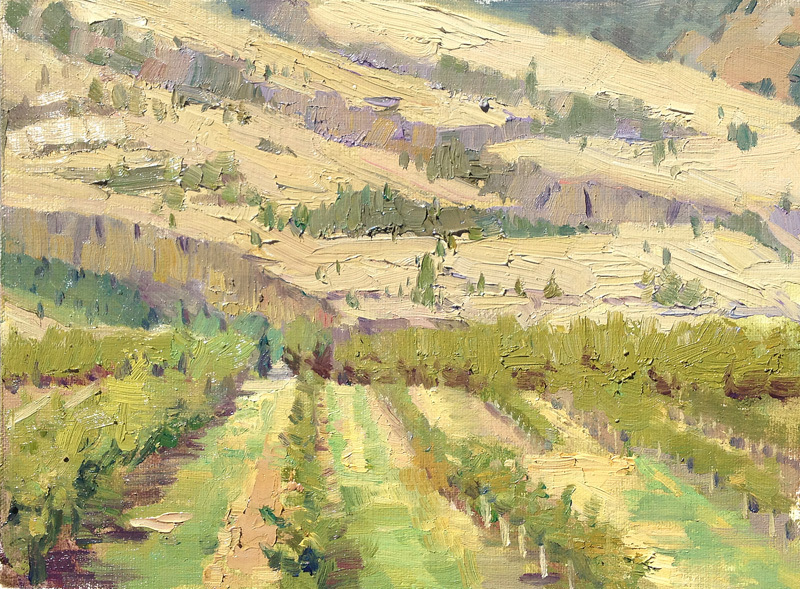 His website doesn't do any justice to the impact the brushwork and texture of his paintings in real life. We found a small creek that didnt look like much at first but after some exploration, I found a really sweet little scene that the 4 of us ended up painting at. from left: Eric Jacobsen, Michael Orwick and Anton Pavlenko. I liked this painting a lot more at the time I did it than I do now. I feel like there are 2 paintings stacked on top of each other. The picture could benefit from some extreme croppage either way. If I cut this one in half I could probably let them stand as 2 decent color studies. Later on that day we went to a secret location that we were told to check out that has a fantastic panorama. This view wasn't going to be open for very long (they were constructing a house from where we were painting) so we knew we had to take advantage of it this year. 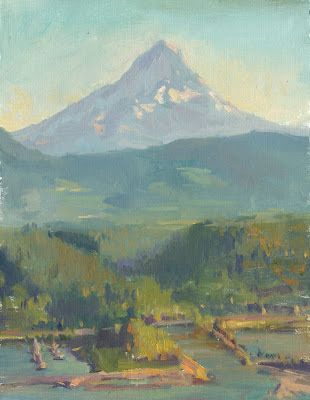 A painting of Mount Hood that really showcases its handsome shape. I am going to have to wait until the next full moon to put it into this painting. I missed it this month but was inspired by the blue moon we got this year. The color of the sky was so pretty. I don't know why I don't paint more twilight scenes. The next day we went to Sakura Ridge Farm to paint in the morning. 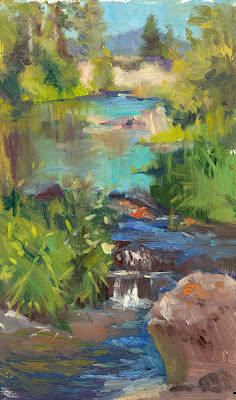 The area is very picturesque, and had some interesting things to paint, but the danger in having too many good scenes laid out for you is that you could end up with too many trite simple paintings. I walked to the other side of the ranch and found a gorgeous view of the valley the river runs through. I had a limited amount of time to catch the remaining morning haze. I painted the background very quickly, perhaps to my advantage. 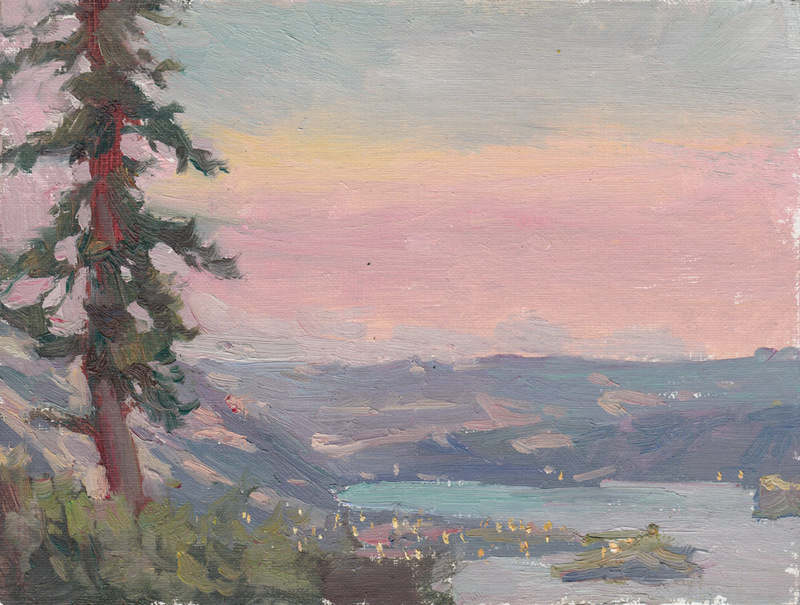 This painting turned out well in its effectiveness of handling atmospheric perspective and not letting the blues overpower the painting. We went out to a plateau above the town of Mosier. We really lucked it with the wind situation this year. The cliffs in the area can usually be really windy but it was perfect this year, giving me a chance to study the beauty of this area. 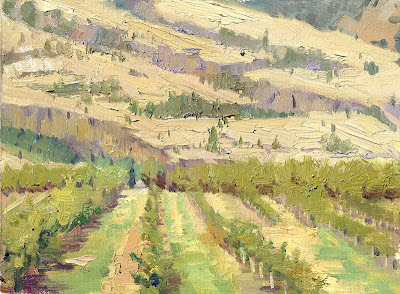 I was really struck by the geometry of the cliffs of the hills against the rows of orchards in the foreground. I didn't do much of note the rest of that day, but the next day I did a painting of downtown Hood River. The hills that the town sit on open up to great views of the gorge as well as the bridge, windsurfers, boats, etc. 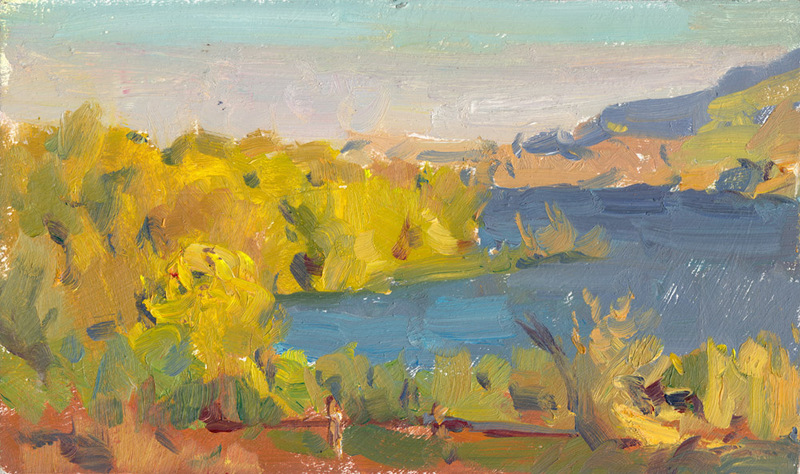 It's something that really encapsulates the feel of the place so I knew I wanted to paint a good view of it. This view had some of my favorite buildings in it so I went with the view down State Street. I took my time with the drawing but at the same time was very deliberate and methodical in my paint application and color mixing. There were a few things I wanted to make sure I did this year, which was a painting of Hood River and of Mt. Adams. I drove down the 35 to paint this little guy. It took some amateur rock-climbing to get to this view but it was a fun one to paint. I enjoyed designing the light/dark pattern of this painting. 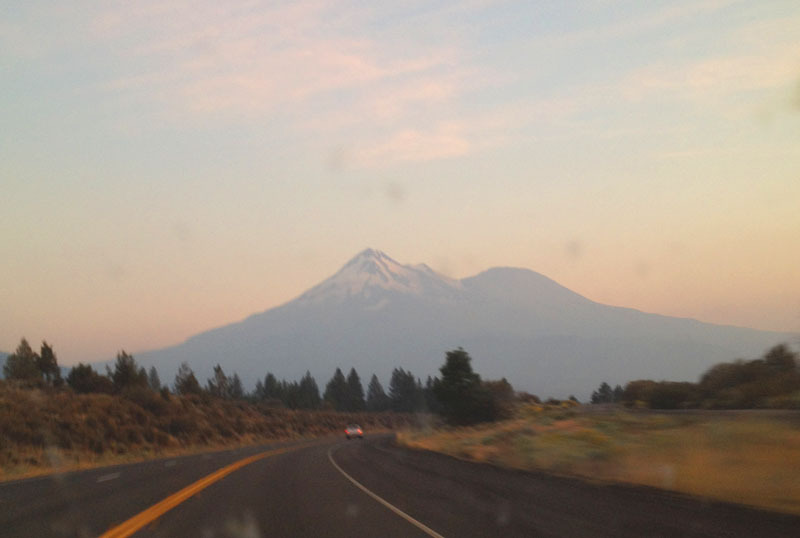 Driving back north to Hood River made me find this sweet view of Mt. Adams beyond the orchards and vineyards. The golden evening light was beautiful but I knew I had to work fast to get the color I was looking for. I ended up finishing this one in my room(I knew I brought my studio lights for a reason!). 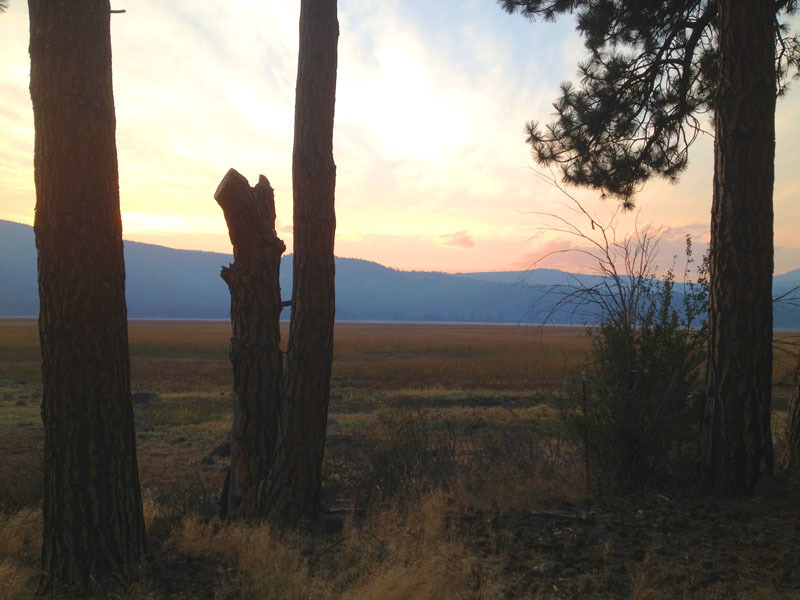 The next day I went out to Horsethief Lake which is a park in Washington across from The Dalles. This is a painting I started last year, actually. I went back to work on it some more this year. If you are curious to see what it looked like, click here. 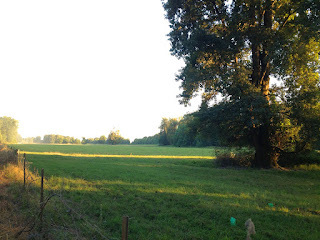 This area, as you can see, is so much different than the area just west of it. 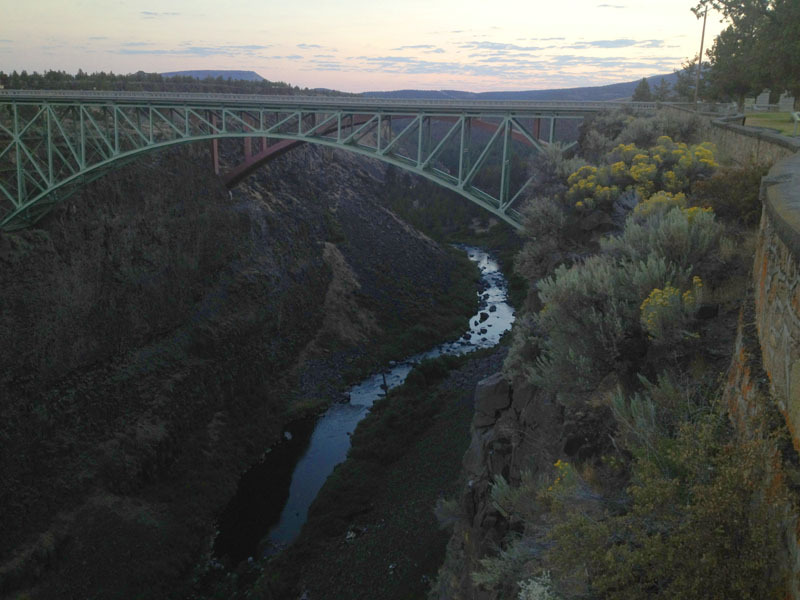 It's hard to believe this scenery is just 20 miles east of the lush greens of the Hood River area. 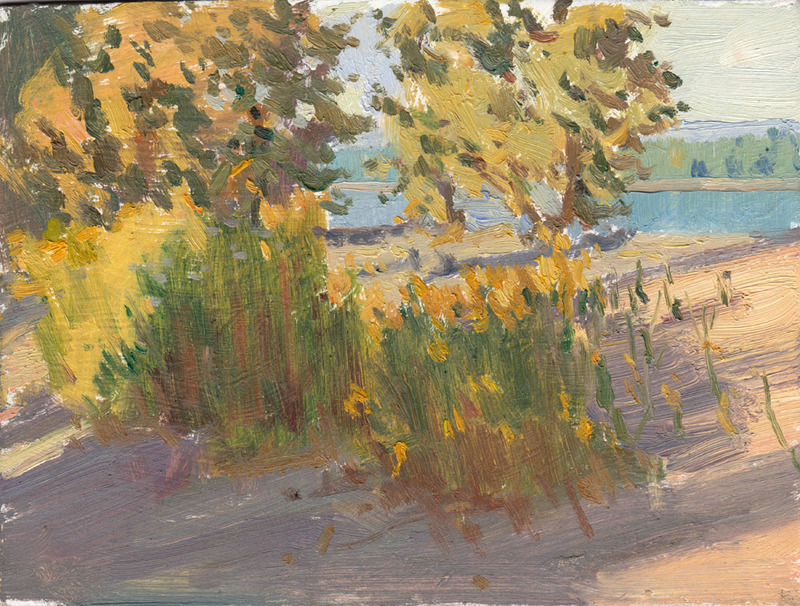 I went back to Sauvie Island to do some color studies that will be useful for me later on once I start working on the new series. 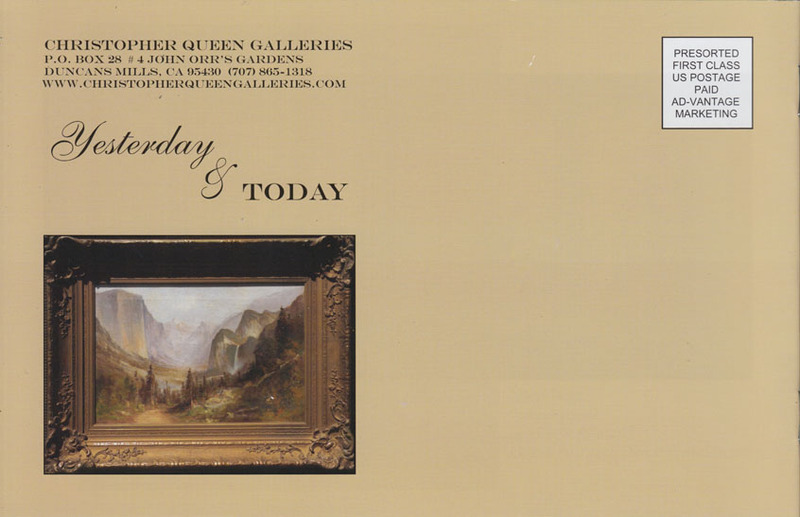 The next day was the reception for the show. Yayyyy! Time to see what everyone else did. So how did I do? Well I am happy to announce that I won 3rd place for "Sleepy Town" and Vintner's Pick Award for "Mt. Adams Sunset!" Thanks to Randy Sexton for choosing my work to be recognized for awards. Tired. Happy. Sundrenched. Ready to go home. I went back through Central Oregon this time to see some new views. 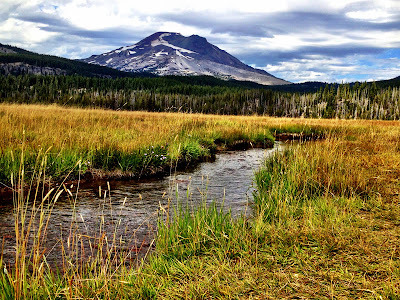 I knew the area around Bend was full of rugged beauty so I made sure to stop there for a day and check it out. The Three Sisters Wilderness has an interesting mountain range surrounded by beautiful meadows and high-desert shrubbery. 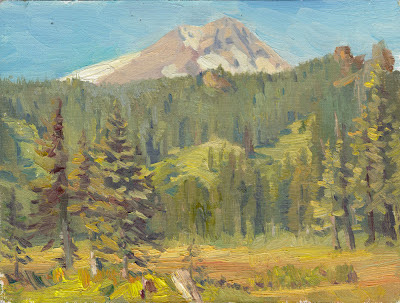 I went up a really rugged road I shouldn't have, and did a quick painting of Broken Top Mountain. And so ends my trip up north. It was really good for me to get out there and change up the scenery for a while. It helps me when I come back home to see things in a different light. I love to compare and contrast new scenes with familiar territory. It's almost time to get back into studio mode, so this was a good chance for me to show off what I've learned and practiced this year painting in the field.